It's getting cooler & all my warm shirts have holes. What are some good area thrift stores? After seeing Amanda's question, we went digging through the archive for stuff about thrift stores and it's been surprisingly long since we've done something. It looks like we're overdue. So, got a suggestion for Amanda (and us)? Please share! Bonus points for a line or two about why you like that store. 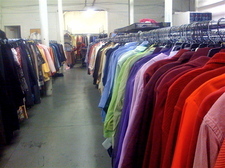 Unless you are looking for bad 80s clothes or something vintage, try Clothes Mentor on Central Ave down from Hannaford. Used (or sometimes new--still with tags) seasonally appropriate clothing and timely styles (within season or two); labels from Banana Republic, Limited and Ann Taylor are prevalent, but you will find stuff from Target too. It's all organized by color, size and item (ie short sleeves in one area, sweaters in another). It takes some time to browse but worth it (also worth selling clothes to them, if you have on trend items and don't expect a ton of money. Anything they don't take they donate to the City Mission). If you are a younger/smaller kinda person, try Plato's Closet next door--more Forever 21/Abercrombie type clothes. Not a store, but in the spring the synagogue on Academy has a rummage sale which has the best women's clothing selection I have encountered at such things. Something Old Something New in the Stonewell Plaza in Slingerlands at the junction of Rt. 85 and Rt. 85A. Pretty good selection of clothing and accessories, although the side of the store with all the housewares, furniture, linens is my favorite part. I second Sarah's comment. I love the salv. Wednesday is family day and everything is half off. Good Finds is pretty awesome too. The thrift shop across from St. Peter's has some good stuff too, "For Pete's Sake"